The cooktop wall is full of cooking supplies: pots, pans, utensils, spices and the more important “junk drawer/charging station.” My fantasy is that our phones will just stay in there all the time while up there, especially at night and that I’ll no longer have an iPad or laptop on the counter charging, but instead inside a drawer, hidden away. The “junk” portion of the drawer is one that I’m very excited about as it’s the first drawer you run into from the kitchen door (where we’ll most likely be entering and exiting the most) and instead of having a tray or a “bowl of anxiety,” I’d like to have a drawer of it so I can hide that anxiety until later. The “anxiety” part (at least in my home) is induced by unopened mail from the IRS and random receipts of things that surely need returning. But up there, I don’t foresee too much of this so it’s mostly for keys, phones and loose change. The peninsula is otherwise known as “the bar.” It’s the part that separates the living room from the kitchen. 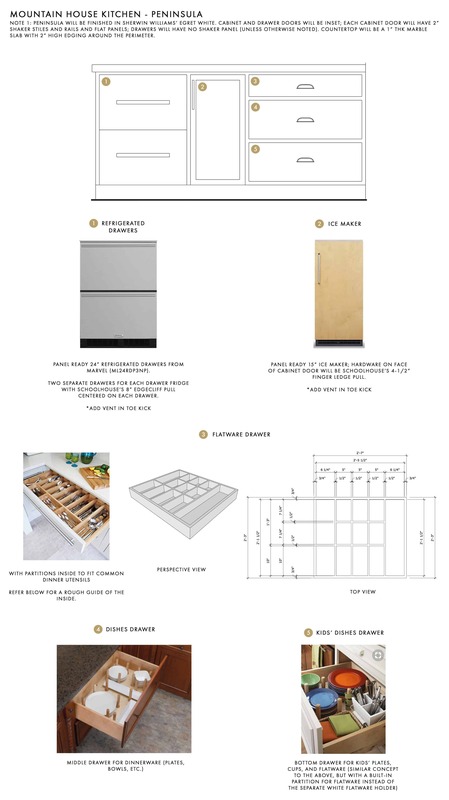 I’m so excited about these fridge drawers (we partnered with Build.com for all the appliances) because the bottom drawer will house kids’ snacks and fruit, and the top one will be mixers and beer for grownups. Also, not having to run and get ice maybe ever again up there seems unbelievable (the closest store is 10 minutes away, which is certainly not far, but there and back is a half hour trip). Anyway, this drawer will ensure that I won’t have to nag them to set the table or unload the dishwasher ever again. On the island, we have the sink, dishwasher and the garbage receptacle. These were all pretty standard but we are building this pull-out, two-tiered tray for cleaning supplies, dishwasher soap, and the top tray is reserved for sponges. In all my life I have never thought I’d have a designated sponge area. What eye-sore can I possibly put next to my sink now?? Time for the full-height cabinets, which were a beast to figure out. We are doing two retractable cabinets doors for the appliance pantry and the dry bar which I am very excited about. Let it be known that you lose a good four to five inches of interior space with the hardware and the additional box you have to build to hide the hardware. You basically use the same hardware as you would a TV cabinet and it’s pretty big and ugly. We decided that it was worth losing the space since we won’t be there 24/7, but if this were our main house, I’m not sure we would have made the same choice. The idea/fantasy of leaving the door to the coffee maker open every morning for two hours without a door in the way trumped the space we were losing. Here, you can see the skeleton of what goes on inside the cabinets. You’ll see that the pull out shelves in the food pantry and the dry bar are designed specifically for short things on top (cans of food, bar supplies) and tall things on the bottom (cereal or mixers/larger bottles of alcohol). Now, I will tell you that we haven’t finalized the interior finishes and will likely do some sort of treatment on the back wall of the dry bar and appliance pantry. This post was more for people who like to nerd out about the hyper specifics of kitchen fuctionality (or need it to get them out of the headache of figuring out ideas for their own renovation). Of course, little things might change, but I go to bed with such peace knowing that when we get up there, we won’t have to think about where things go. I hopefully won’t regret shelving height (although they will likely be adjustable) or feel like we missed something. This very second, I don’t know where the Tupperware will go, but don’t worry, I’ll be sure to ask Brian to weigh in on this. I’ll do this first thing in the morning before he’s had his coffee. There is nothing he loves more than me bombarding him with esoteric design decisions at 6:40 am. So for all you kitchen pros out there—either designers or expert home-makers—what are we missing and should anything change? The cabinet boxes are almost done, but I don’t think things like the flatware drawer is finished yet, I don’t know how much we can actually change, but I’d love to hear your ideas and if nothing else then others reading along can learn from your advice. Yes, less Gifs and auto play videos. Those both tend to crash the site on my mobile device whether I’m on WiFi or not. Some days I’ve just given up after multiple reloads. Anyway, this is a GREAT post. So amazing to see what you do for your family’s kitchen when you have enough space! Me too! Glad I’m not the only one. Every time I want to look at the blog, I have to weigh whether it’s worth crashing my phone/computer. Indeed gifs – there was some discussion in the comments a couple of weeks back about the fast-moving gifs (plus all those darned video ads) making the posts hard to read and how we all wanted to just stare at beautiful non-moving photos. Your team said they’d think about it – I like to think they’ve responded especially to that thread!! Either way this is a great post! Agreed—the auto-play videos are especially troublesome for me. At home, if I’m not right next to the router, I have the worst time trying to load this blog, and I live in a city, so not even dealing with slow rural internet connections. Amazing! Pinning for future kitchen remodel (of my dreams). Don’t forget tinfoil, plastic wrap, ziploc, grocery bags, etc. Great post! A couple of things – my understanding is that vertical spice storage next to the cooktop isn’t necessarily the easiest to work with – labels are on the side of the containers which are ~30” off the floor for the top row (lower for anything below that) – basically hard to read from a standing position. A better approach is a spice drawer – like something by Rev A Shelf. In place of the spices in the narrow pull out could be oils, vinegars, etc (usually distinctive enough you can tell what it is from above), vertical storage of aluminum foil, Saran Wrap, etc, and/or a couple of hooks that hold a set of oven mitts – sometimes handles get hot. Hiya. We have a spice pullout right now and It didn’t occur to me that its annoying to read. I believe its too late to make a shallow drawer under the cooktop, but I think you are right that that would have been more functional for viewing. I suppose that it could be a drawer within a drawer of the top drawer underneath the cooktop? Just keep a sharpie handy and write the name of the spices on the lids. Problem solved. Just make or buy labels for the TOP of your spice jars. I keep my spices in a drawer. Labeling the top of the spice jars works perfectly. I felt the same about “struggling” to find the correct spices because you are looking at the tops of the jars, maybe you could put labels on the tops of the jars so they would be easier to find. Thanks for this post, I’m in the middle of planning for a kitchen remodel in my 110+ year old home, this cabinetry post has given me some new found inspiration. Just do a slanted spice drawer. It keeps them on their side, so labels are clear. Yes I wholeheartedly agree! I have this and it by far is the smartest thing I did with my drawers. I put the stuff like ladles and whisks in the pullout drawer next to the cooktop. Just use another drawer or use some of the utensil drawer. Do you have a dedicated drawer for ziplock bags, plastic wrap, tin foil, and parchment paper? I would put this with the tupperware near the sink and dishwasher. As you are clearing the dishes, you will want to have access to both of these so that you can easily store leftovers. I think the plastic wrap, etc would go in the middle drawer on the far right of the cooktop, with the tupperware. It might be really deep, but we can always do a drawer within a drawer (but that does eat of space). In my experience, drawers within drawers solve all problems! I use one for foil wrap etc. and I also have a deep drawer for storage containers with a DWD for the lids. Also, unless most people who will be using this kitchen are left-handed, I would switch the spice and the utensil pull-outs so that the utensils are on the right especially since the baking utensils are to the right of that pull-out. I have to agree with Beth. I have recently had a new kitchen done and put in a LOT of drawers within drawers. They might seem to eat space at first glance but the opposite is true. I also have one just by the stove instead of a spice rack – wouldn’t change for the world! The same goes for the foils and wraps. I cook a lot so the usability of my kitchen is super important for me. Beyond amazing are also full extension drawer slides. Even the items stored towards the back are fully accessible. Love love these! Who needs plastic wrap? Single-use, non-recyclable. just put leftovers in one plate and cover them with another plate, like the rest of the world is doing. Hey Emily! Never commented before, but wanted to put in my two cents. 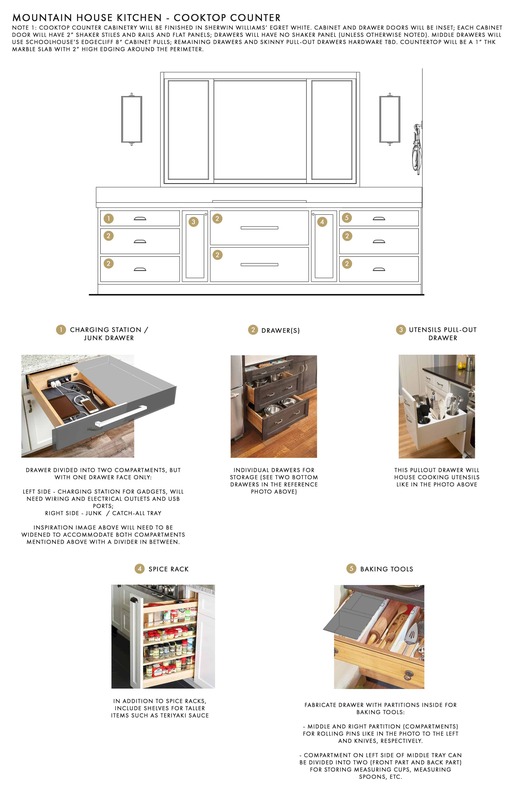 For the big flatware drawer, be sure to talk to your cabinetmakers about perhaps reinforcing that drawer or using super heavy duty hardware. My parents’ kitchen has a drawer similar to what you guys are planning, and between the weight of all the silverware and how much that drawer is used, it’s struggling after 3 years or so of use. Just a thought – love the blog! Same goes for the slides on the trash drawers. Make sure they are rated for a higher weight load. Trash can get pretty heavy. And people tend to push down on the trash, so there’s that extra abuse. A dreamy kitchen with dream storage. Currently imagining organizing all my things in a kitchen like this and it is just the meditation needed this sleepy Monday morning. Literally cannot wait for the reveal. Make sure there is room for spoons and butter knives near the coffee maker and toaster. Also a small cutting board for spreading butter on toast and plates to serve the toast. You don’t want to cross the room to grab some. Yep. Agreed. We’ll likely have it in pretty containers (spoons and butter knives) and definitely a board for cutting. Thanks! Is the spice drawer insulated from the oven? Oils, vinegars, and spices spoil when they’re exposed to heat. Its a cooktop not a range so it should be fine, but mine is near the range now and its no problem! Awesome kitchen!! Just one suggestion about the pull-out spice cabinet by the oven. I have one that was already in the house I bought and I hate it. It seems like a cool thing, but I cook a lot and I hate bending down and digging around looking for what i need. I really would prefer them at eye level. Seems like a small thing, but its just annoying. My suggestion for that space, use that skinny cabinet as storage for baking sheets and/or cutting boards. That’s what I wish mine was because i’m tired of storing baking sheets in the oven and then unloading it every time i need it. I do keep a tray by the stove with a small bottle of olive oil, a salt cellar and a pepper grinder for regular use. If you don’ t want it on counter top, think of a place near the stove to house the essentials. Oh and one other thing- in the layout, it says utensil and knife storage but the reference picture is a pullout utensil drawer. Consider doing a custom drawer for proper knife storage. Hope that helps! Interesting. We could also do something pretty on the wall on the right for spices…. we have a pull out drawer now and it only bothers me a little, but I don’t cook a ton (although the last few weeks, with SOUPtember I’ve been cooking way more). Agreed that if you cooked a lot this situation could be annoying …. Great suggestions! We have a skinny cabinet that we use for precisely that: baking pans, cupcake tins and large cutting boards. I absolutely love it. And we have two shallow regular pull-out drawers with Rev a Shelf spice shelves, and it’s easy to see and find everything. As far as knife storage, something like the Knife Dock storage tray from Sur La Table is an easy solution. I love all the built-in storage options, but my suggestion is to leave a couple of drawers without anything built in to give yourself some wiggle room as needs evolve. Same with shelves; definitely be sure they are adjustable. I agonized over our pantry and drawers when we did our kitchen a few years ago–planning everything–and I’ve made several organizational changes in the few years since. For instance, we have a whole pantry shelf devoted to cereal. (My kids are carb loaders for sure.) So I measured the top height of a cereal box and arranged the shelf height that way. But after the 40th time the kids left a brand new box of cereal open in the pantry, I moved to those POP/Oxo type-storage containers, which are much taller or shorter than typical cereal boxes depending on the size you buy. If I had fixed shelves, it would have resulted in a bunch of wasted space. Sensational and incrediably helpful post – thank you! I know how long it takes to get and synthesize information like maximising, efficient practical placement, whilst beautiful from the outside working in a puzzle. Thank you for simplifying this down and sharing! This is very thoughtful! The only thing I would warn about is the under the sink cleaning supply plan. I am paranoid over kids (mine or not) eating those dishwasher pods, drinking clorox, etc. Maybe find a place to store all the chemicals up high? A little walk is worth it to not be dialing Poison Control. Full disclosure, my kids eat all the things that can kill them so I have that number on speed dial. I had the exact same thought and then wondered if there are already guidelines to follow for people who rent their homes as Airbnb’s that cover possible risks and/or insurance liabilities (like dishwasher pods)..? What’s the cost of the fridge and dishwasher? I can’t find thus info anywhere and need to know if this is even in the cards for our new kitchen Reno. Thank you! Pretty easy? More like a pain. Register online. Fill out address, telephone, email, blah, blah, so I can be added to Viking’s email list? It takes two seconds to reply. Now that’s pretty easy to do. Did you check build.com as that’s the appliance partner? I bet they’re pretty easy to find there. Can’t be too many Viking, panel ready fridges with 2 drawers on the bottom. Love this. I spent hours, days and weeks, with a taped off, pretend kitchen in our rental while I visualized where I would stand to mix baking items, cooking items, where drawers were in relation to the dishwasher so I wouldn’t need to take a step while unloading, where we would be when desiring a garbage can, etc. I can totally relate to this post and I will say that every woman who has come into my kitchen knows exactly where to look for something b/c it makes total sense. Something to consider if not too late….a second spot for a garbage can. It is a total luxary to not have to walk across the kitchen to throw something away. I can reach both very conveniently and both are located in very convenient locations. It is a first world problem if someone complains about having to walk ten steps to throw something away for sure. But when designing your own kitchen from the ground up, for the sake of efficient movement, clean counters, and ease of use, a second garbage is wonderful. Also, it means that no matter the size of your gathering, you don’t have to switch out your garbage until the end of the night b/c there is plenty of room! Also, I am a tree-hugger from WA State transplanted to the Midwest. I love recycling. Your piddly, one “bin” aint worth a darn. Open a few cans and a few boxes of pasta and time to take it out. You need a bigger area than that if you don’t want to empty it daily. So my one suggestion would be to go back to the drawing board re: garbage and recycling. Oh, and where do you see yourself actually mixing up stuff to cook and bake. Have spices, bowls, etc. right there. What a dreeeeam! The one thing that jumps out at me is not having coffee, toaster and cereal bowls near the rerigerator for easy access to milk, cream, butter, etc. Right now I’m picturing a lot of layovers in between the coffee bar and fridge right on the dry bar counter. Could the two bar spaces be swapped? Love it and am just drooling over all the built-in organization. My only question is regarding the all-important cereal bowls. Will you be able to reach in and just grab one bowl without having to pull out the whole stack? From the mock up, it looks like if there’s even three (four?) bowls stacked, you may not be able to. In my cramped NYC apartment, I have to do that for some things and it always annoys me. I don’t see a space for baking stuff (muffin pans, sheet trays, etc). We have a mountain house and we do a TON of baking up there, especially with the kids, over cold mornings. A dedicated spot for that stuff is great. I like to store it upright for easier access. I would suggest the bottom of the Skinny Pantry with at least one divider for things like baking sheets, cutting boards, and cake pans OR above the wall ovens (also with dividers). I also don’t see space for storing large serving pieces like platters and big bowls. With large groups we ended up having to dedicate a pretty significant amount of space to those pieces and they take up more room than you’d think. Overall this kitchen looks great and I appreciate all the thought you are spending on the little pieces that make a house livable AND enjoyable. So helpful, we’re in the planning stage of our own remodel. Would it be possible to get the dimensions of the cabinets and drawers? It would be great to help visualize the amount of storage each cabinet has. Thanks! Hi Emily and team! 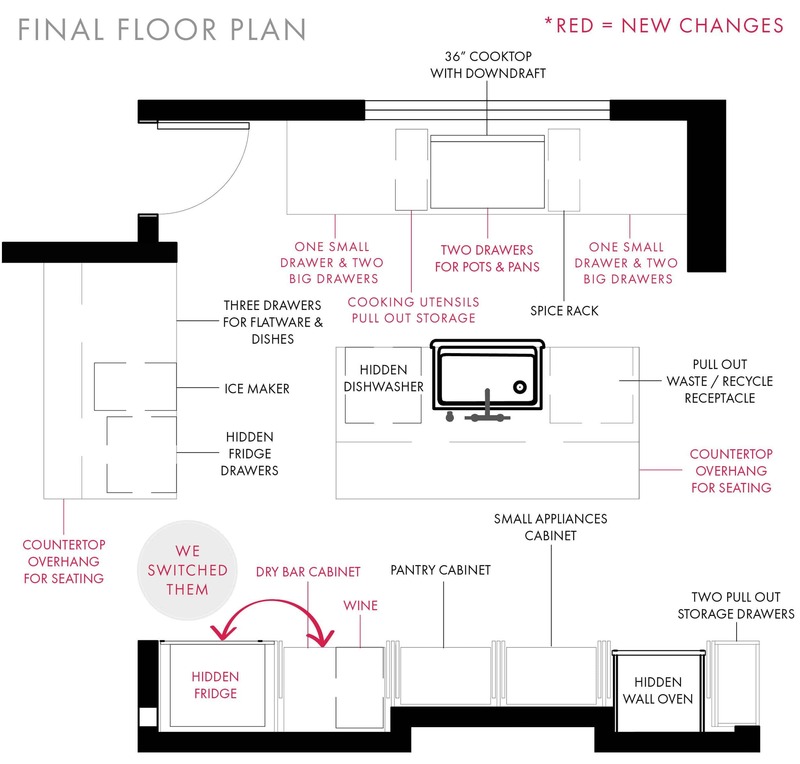 Bravo, this is so amazing and helpful as we are knee deep in our own kitchen renovation and are at the stage of layout. So I have to agree with everyone else about the spice rack. I currently have it and hate it. 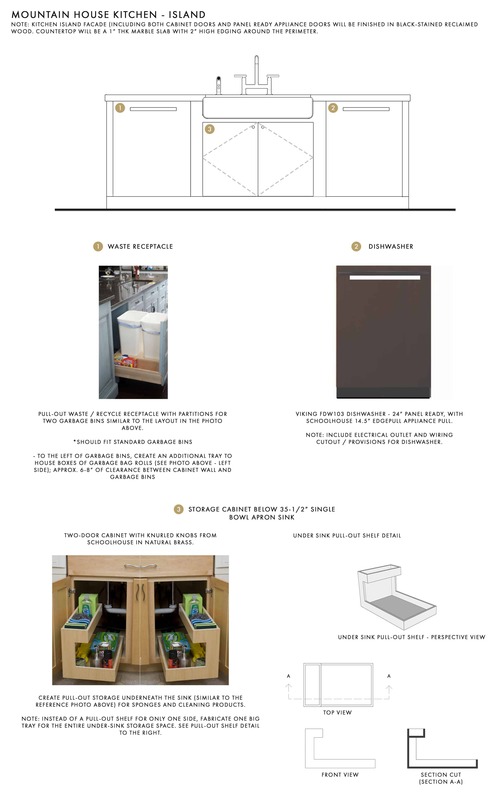 What I have seen that I am excited about (and that you might be able to switch it out to) it storage for the sheet trays, cookie sheets and cutting boards. They can all live in the same size space and makes storing thin- yet large pieces like that a great use of space. Keep up the amazing and fun work! I just want to say kudos for kids + dishwasher. That was my kids’ first REAL chore (not just pretend chores they “did” alongside me) and it was the best day in the world when I could pass that along to them! It goes a LONG way for kids to know they’re important to a household. In a book I read (and loved and need to reread b/c it’s been years Cleaning House: A Mom’s 12 Month Experiment to Rid Her House of Youth Entitlement), it went so far as to site evidence/study/something about suicide among youth being connected to NOT feeling important and needed within the family unit. So important for our kiddos to have real, worthwhile responsibilities at home! Oh agree so much with chores for kids, will definitely check out the book recommendation. Its great Emily’s children will be close to nature in a mountain house. This reminds me of a fascinating read I bought last year titled A Country Called Childhood: Children and the Exhuberant World. It’s all “back to nature” yet written in the most eloquent way. My favorite chapter is “the character fault of exhuberance” and how the author argues that today’s perceived attention deficit/hyperactivity was “cured” by outdoor play. Meaning in the past, kids were restless, parents just sent them outside. We are building our first home and will keep all these tips in mind for our kitchen! where are paper towels going? I am European so I suppose this just is different but the focus and space dedicated purely on easier consumption of alcohol is something definately not common here. Not sure if it is bad or not but strange still. Love these ideas but agree about that spice rack–my MIL has one and she hates stooping to read the spice labels. More importantly, will you post about how you would baby proof these beautiful cabinets/drawers? I know at almost three Birdie probably doesn’t get into things you don’t want her to, but if you’re using this space for a family-friendly rental, babyproofing might be a need. I hate all the devices we’ve tried on our cabinets and drawers and would love some user friendly, cabinet-saving tips! The above design drawings are really bringing the kitchen to life for me! I know British painted cabinet kitchens were used as inspiration. Can you tell us which kitchen cabinet company you are going with that has translated that look so nicely, and that has the special pullout shelves, drawers, etc.? It really looks like a kitchen you can live in…yet it doesn’t scream “I am a KITCHEN.” Quite a magic trick!!! 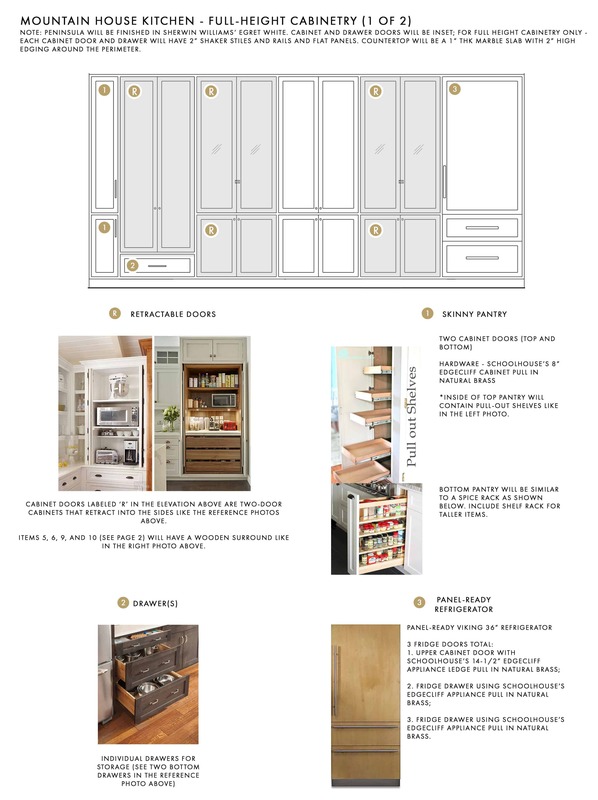 The concept of a small appliance pantry is what I’m most excited to see and now top on my list of must haves for the future kitchen renovation. I know your doors side back into their frames, so is that how you handle not trapping steam from your coffee maker when it’s in use? You leave the doors open when coffee is actively brewing? According to your “red” changes you are opting to change out the big drawers on either side of the cook top? Don’t, don’t don’t! Why would you do that? So much less convenient. You have to open doors and then pull out shelves. Assuming pullouts, at least. A 2nd garbage, if you can swing it over near coffee bar you will really be glad you did. And thous cabinets in that Sustainable house really are beautiful and tweak the Shaker look in a great way. How about doing that? Kudos for all you and your teams thoughtfulness! And Yep, I wouldn’t put the alcohol on the bottom shelf. I know this has been discussed before but I still can’t fathom the need to hide some of the most functional and often used items in the kitchen behind those expensive retractable doors. I very much appreciate their use in a sleek, modern kitchen that’s open to living/dining spaces but here, it seems like you are only hiding these things from people who are already in the kitchen. In a mountain cabin, no less. If I were a vacation renter, I’d have to keep them open all the time or go crazy opening them all do find the dang oven. I’d probably do the same if I lived there. Yeah, I second this. I’m not really clear on why you need to hide everything in a vacation house. I would be so lost/confused as a guest in this house, especially if I woke up before my host and just wanted to make a pot of coffee! Also the cabinets in the master closet are a mystery. Ahhh – I’m so in love with this kitchen and it doesn’t even exist yet!! Or does it? Anywho, one question – what are you planning to do for vertical storage, like cutting boards and cookie sheets? I’m a trained pastry chef and have way more specialty baking items that one person should (2, if you include my husband who eats the baked items; 3, if you include my dog who likes croissant scraps). But surely you have one or two cookie sheets, muffin tins, popover pans, pie dishes, etc. wow. kudos to Grace, for such careful thoughtful planning. It looks amazing. what a dream to be able to afford such luxury. it does scream a bit “excessive” with all the appliances and storage space and lighting… that’s no knock on your success or design. I know I’m the minority when I crave simple and small. cars, spaces, inventory. enjoy it all, thought! I am with you. This kitchen is lovely but way too excessive for a family of four. For trash, please consider a foot pedal or spring release mechanism (that you bump your hip against) so you don’t have to use your hands every time you need to throw something away. It’s especially useful when working with raw meats! Also, allow a small drawer for all your dish towels/rags. And another for placemats, napkins, etc. Hi i love the drawings and renderings. What program do you use. And what cabinet company. This blog is absolutely beautiful inspiring! Thank you for sharing such great insight and creative ideas. Looking forward to following you regularly. I would love to know what programs Grace uses? Loved this post – design nerds unite!! One question: What are the horizontal black lines in the drybar cabinet? Did I miss something… where is the freezer? In other words where will the ice cream live??? Nevermind. I found it. Your drawing noted that each drawer on the fridge was a fridge drawer so I thought it was a column fridge with separate freezer. Glad to know the ice ream has a home! I love my kick plate drawers. I have one for cookie sheets and one for placemats. Perhaps I didn’t look/read carefully enough, but as I understand it, the upper shelves on the larger pantry are fixed (not pull out). If this is the case, I would consider cutting away a portion of the shelf, leaving some on the sides and back, so that items don’t get lost (similar to the appliance and coffee bar but a portion of the shelf could be left on the side – sort of a squared off “C” shape). Deeper shelves just end up hiding half of what you have. Wow. Incredible. Are there any countertop appliances? Maybe a can stair ? Si you can look at all the cans arranged in heights ? Great kitchen! I am designing a large Reno project of my own in Canada and nerding out on this. I was sad to find out that a microwave in a closed cabinet was not up to building code. I rarely use one and wanted to hide one too. Even my appliance garage, that is a top priority, needs to have a motion activated plug that cuts power to plugs when closed. I can’t even fathom how 2 wall ovens in a cabinet would ever be permitted or pass inspection here without having to tear out those expensive and beautiful cabinet doors. Especially considering it is a rental. Imagine someone not as attached to the house as you, forgetting to turn oven off and closing cabinet doors and leaving… Fire hazard, and I am pretty sure that unless it is code would void your home insurance and any coverage if there was a fire… Sorry to be negative on this but we have enough rental experience to know that expecting others to have common sense isn’t the best plan. Safety codes are there for a reason. That said, I am sure you have considered all this and maybe we just have different safety standards here. I hate how sometimes reality gets in the way of my best ideas. This post is the most useful post I have ever read about kitchen design. My husband and I are about to embark on a remodel of our existing kitchen and utility area. This post is really helping me to think more precisely about what do we really need and where should it go. There are so many ideas I can use, even though I have a modest budget. Thank you for your consistently funny, inspiring stories. Even though I live in England where spaces are MUCH smaller, many of the ideas are still relevant. Have a lovely autumn! Hi! I am a kitchen and bath designer in Charlotte, NC and have always loved your blog (follow on Instagram, fainted over your target collection when it was very first introduced, long time subscriber) and have loved following your mountain fixer journey. As far as functionality, everything is perfect and flows nicely!! Butttttt- I would switch the fridge and wine section back. I promise it will function so much better when you are working in the kitchen, even though it is a small detail (I know you get it ;)). Ideally you should have it closer to your double oven but I know that wall is a step in. I like to think of the kitchen in zones rather than the old triangle (*rolls eyes*). You have your sink, dishwasher and pull out waste grouped together= perfect clean up zone. Cooktop with all your pots/pans/dishes and cutlery near by = perfect cooking zone. But the back wall could be arranged better to actually create a baking zone while keeping the fridge relative to the other zones instead of being off in the corner by its own. Hi!! I love your stuffs 🙂 Just a quick question…. For those of us that have more than one crock pot and electric pan, and the air fryer and deep fryer and….. I have cooking equipment spread everywhere. Would you have a solution for the gadget cooker? Oooh what about a bakers closet? This is amazing! Thank you for sharing. We’re starting on a massive remodel and this will be such a huge help in figuring out the kitchen. Love it! Thanks for sharing! We just finished our kitchen and I have a similar tall food pantry next to fridge. I’m guessing based on the model it’s 27” deep like ours? If so, I’d recommend making the top shelves shallower (not to front edge of cabinet) or build a false back so the cabinet is 18-20” deep. At 27” it’s basically a cavern. Stuff gets lost back there and ergonomically it’s hard to reach. Very informative and useful (I’m working on planning out my own new kitchen). Thank you. Love the rest of the design and really appreciate the insight into features that eat space but are worth it, work for your family already, etc. Is there a nearby spot for a broom or stick vacuum? I really wish I had a place to store one in my kitchen. I am also very curious where you store your dish towels. I ask because they are an issue in my house. They get caught when opening and closing a shallow drawer but I don’t know where else to put them. Sorry if this has already been covered, but in looking at the shelves above the dry bar, the lowest shelf only has 6″ of clearance. The rod across the front is probably 1 1/2 – 2″ up from the shelf which reduces it even further. So that’s a really tiny amount of space to squeeze a cup into. In fact, it might even be difficult to reach your whole arm to the back of the shelf so you could basically only line up shot glasses across the very front. It might make more sense to go with 2 shelves on that side. It won’t be symmetrical with the other visible shelves, but by the time you load them all up with dishes and glassware I’m not sure the symmetry will be that evident anyway. Randomly, I’d love to know which design programmes Grace used to draw the skeleton of the cabinetry interiors and then to render them? I simply love this detailing! Emily and Grace, I think this is possibly my favourite ever post…. somehow you got all the elements of my dream kitchen in there. Particularly love the charging drawer, that’s an amazing idea. One question – where will cookbooks go? !